Davontae Sanford at 14, when he was arrested. 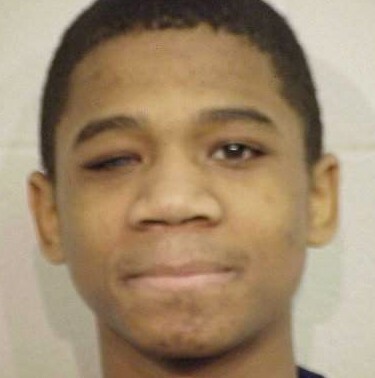 The case of a 14-year-old child, blind in one eye and developmentally disabled, being arrested, charged, and sent to adult prison in 2008 under these circumstances has gained international attention. Crane and David Moran of the University of Michigan Innocence Clinic, flanked by other attorneys and law students, announced that they had just filed a “motion for relief from judgment” asking for a new trial for Sanford. 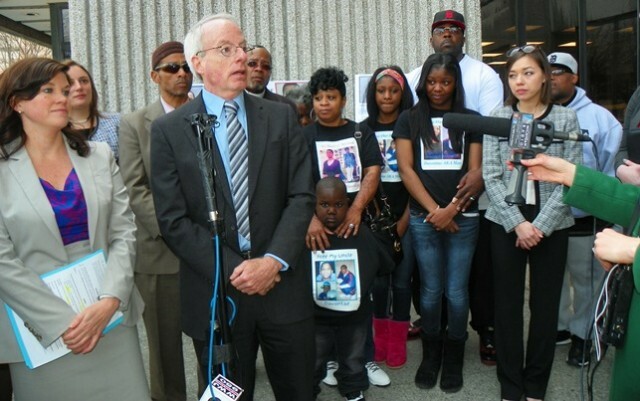 Attorneys Megan Crane and David Moran join Taminko Sanford-Tilmon, Davontae’s sisters and little nephew, and (behind sisters) father Jermaine Tilmon at press conference at Frank Murphy Hall April 15, 2015. Also in photo behind Moran are Khalil Fareed, and Detroit Pastor W.J. Rideout III. JPay, a way to communicate with prisoners by email and send photos as well as money, can be accessed at https://www.jpay.com/. 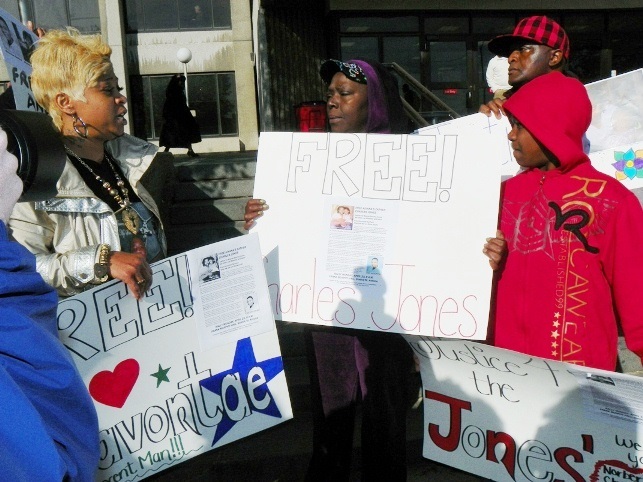 Davontae Sanford’s family and supporters after Appeals Court decision in his favor in 2013. Detroit News reporter Oralandar Brand-Williams is taking photo at left; kneeling in front is Roberto Guzman of Coalition to Free the Wrongly Convicted. Sanford-Tilmon stood with her husband, Davontae’s long-time stepfather Jermaine Tilmon, Davontae’s sisters and little brother, mentor Sylvester Long, Roberto Guzman of the Coalition to Free the Wrongly Convicted, and others who have worked for Davontae’s freedom since his conviction. 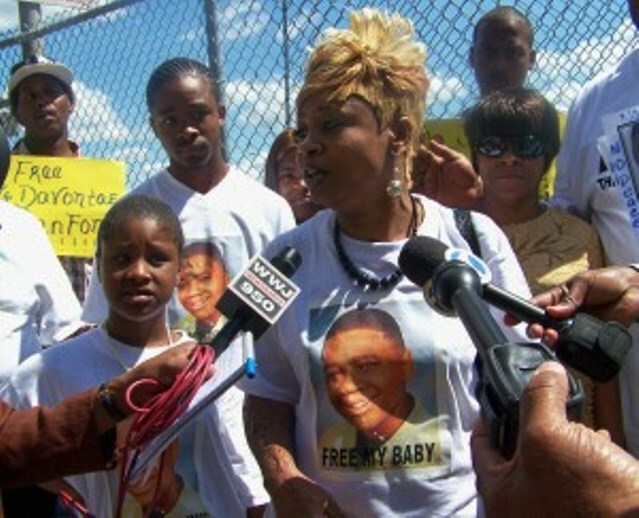 Taminko Sanford speaks at rally for her son outside Frank Murphy June 29, 2010. 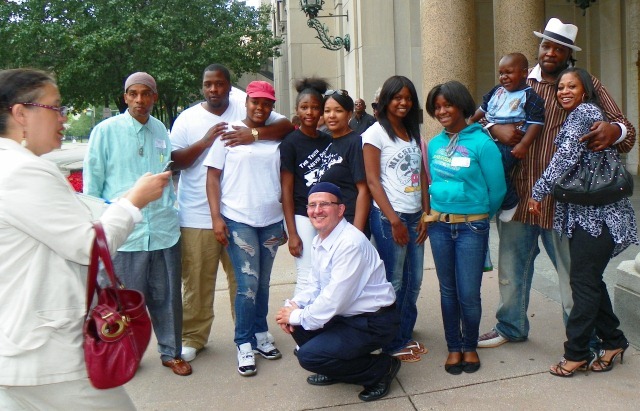 Sanford-Tilmon has coordinated numerous rallies in front of the Frank Murphy Hall of Justice and the Court of Appeals. She has been interviewed by international as well as local media. Bill Proctor, formerly of Channel 7, who runs his own innocence clinic, and Darcy Delaproser of Ireland, who works on behalf of adolescents, are chief supporters. Davontae’s family and supporters have attended dozens of trial hearings at all levels up to the Court of Appeals. They remain wary, because they thought they were on the verge of victory after an appeals court ruled earlier that Wayne County Circuit Court Judge Brian Williams had “abused his discretion” and remanded the case back to him. 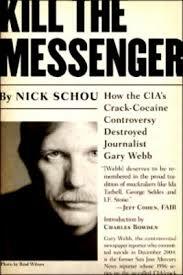 Prosecutor Worthy, however, appealed that decision to the Michigan Supreme Court and it was overturned. Vincent Smothers at Michigan Reformatory. Photo/New Yorker. A 24-page detailed confession from Smothers, who has previously signed multiple affidavits confessing to the murders, as well as admitting his and his accomplice Ernest Davis’ sole involvement in interviews with media including The New Yorker and the AP, is attached to the innocence clinics’ motion. “I cannot emphasize strongly enough that Davontae Sanford was not involved in the September 17, 2007 murders at Runyon Street in any way,” Smothers says in the current affidavit, dated March 6, 2015. It gives complete, accurate details of the crime, Sanford’s lawyers said. 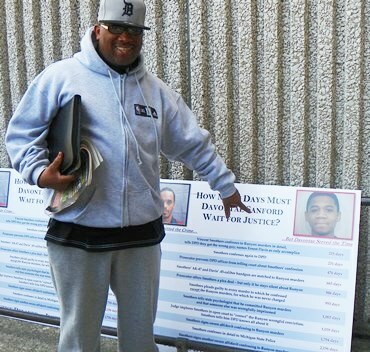 “Before my arrest by the Detroit Police Department in April of 2008, I had never met, spoken with, or even heard of Davontae Sanford or anyone connected to him. 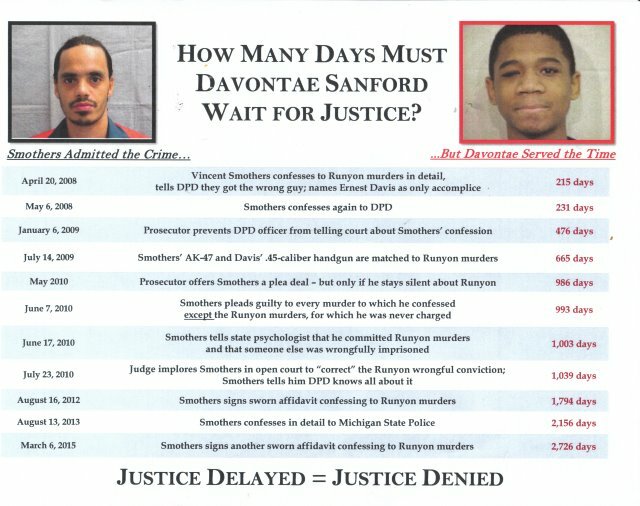 Davontae Sanford is being wrongly incarcerated for crimes that I know he did not commit,” Smothers writes. 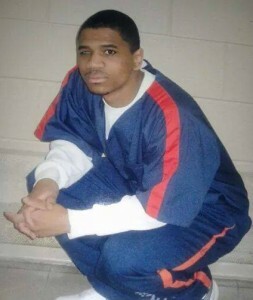 Sylvester Long, author of “State Prison,” who has himself served time, is a family friend. He will mentor Davontae when he comes home to help him adjust. In contrast, said the innocence clinic attorneys, Sanford’s confession was riddled with errors, including naming several friends as accomplices, who were never charged, naming weapons there were not used in the killings, and giving differing, conflicting versions of the crime. The New Yorker published a video of his “confession” in which he is clearly being led on by the detective, at http://www.newyorker.com/news/news-desk/the-hit-man-or-the-kid. The New Yorker also ran an article describing Smothers’ life at http://www.newyorker.com/magazine/2012/10/15/the-hit-mans-tale. Sanford, in his pajamas, just happened on the scene of the crime near his home, attracted by police lights and sirens. He told police at the scene that his uncle was a Detroit cop. He was later taken in and interrogated without the presence of his mother or an attorney, but still denied any involvement. Wayne Co. 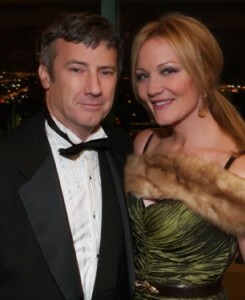 Circuit Court Judge Brian Sullivan, shown with Tracy Sullivan, repeatedly refused to allow testimony from Smothers or his attorneys during appeal of the case. His new attorneys said Sanford did not plead guilty to the murders until the middle of a bench trial before Wayne County Circuit Court Judge Brian Sullivan, on March 18, 2008, after it became apparent that his defense attorney, Robert Slameka, had done absolutely nothing to defend him. But Moran said Wayne County Prosecutor Kym Worthy has not yet withdrawn the charges in Davontae’s case, and has refused to discuss the matter with them. Runyon street house where murders occurred. 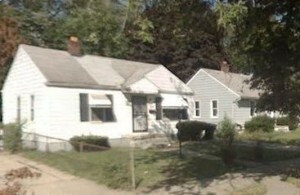 On the night of Sept. 17, 2007, four people watching a football game in a home at 19741 Runyon St. on Detroit’s east side lost their lives: Michael Robinson, Sr. 33, D’Angelo McNoriell (early 20s), Brian Dixon (early 20s), and Nicole Chapman, 25. Valerie Glover, 30, was critically wounded but survived as she hid under the bed of Michael Robinson, Jr. 7, who remained physically unharmed. 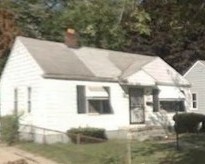 The senior Robinson, who was known to sell only marijuana from his house, was the actual target; the others were visitors. Smothers first confessed to the Runyon Street murders on April 19, 2008, as part of his confession to a total of 12 murders, including that of Rose Cobb, wife of Detroit police officer David Cobb. Smothers said he was hired to commit the Runyon Street murders by Leroy Payne, who operated a drug ring along with his boss Delano Taylor, now deceased. Aiyana Jones’ grandmother Mertilla Jones (center) listens as Taminko Sanford speaks during rally for their children April 23, 2012. Davontae’s signs were made by Jones family member. Smothers says he discovered during his confessions that another man had just been convicted of the Runyon Street murders. Fifteen days previously, on April 4, 2008, Wayne County Circuit Court Judge Brian Sullivan sentenced Sanford to four concurrent terms of 37 to 90 years, with two years on a gun charge, according to the motion filed by the innocence clinic lawyers April 15. Sanford was then 15. He says no Detroit police officer ever followed up with questions about Runyon Street, although Sgt. Gerald Williams told the court during a preliminary examination in front of Judge Craig Strong that Smothers had confessed to the Runyon Street murders. Detroit Police investigator Ira Todd, who Smothers confessed Runyon Street killings to. Smothers says he “repeatedly and consistently confessed to the Runyon Street murders for seven years,” to Ira Todd of the Detroit Police Department, Kentucky detectives who were tracking James Davis, the brother of his accomplice Ernest Davis, Michigan State police detectives, his attorney Gabi Silver and defense investigator Linda Borus, in addition to the officers present April 19, 2008. He says it is absurd that he would involve a “kid” in his hits. Poster compiled by the NWU and UM innocence clinics. The motion and affidavit show that they are filed in the courtroom of Wayne County Circuit Court Judge Lawrence Talon. It is Case. No. 07-015-018-01-FC. Judge Sullivan earlier denied Sanford’s motion to withdraw his guilty plea as filed by the State Appellate Defenders’ Office. Moran said, however, that an appellate decision on the case indicated it should have been filed as a Motion for Relief from Judgment, which the law clinics have done. Wayne Co. Pros. 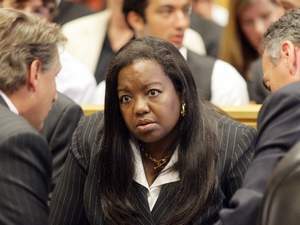 Kym Worthy listens to her assistant prosecutors, including David Moran, at right, who assisted in the Sanford prosecution. He said they now await the setting of a date for the hearing. Assistant Wayne County Prosecutor Maria Miller said in a statement on behalf of Prosecutor Kym Worthy: “We are aware that a new brief will be filed in the case. At the appropriate time, we will file a response and argue our legal position in court.” However, such proceedings can further prolong Davontae’s unjust imprisonment. All Worthy has to do is withdraw the charges. Read motion at DSVS motion pt1.compressed and DSVS motion pt2.compressed. Below is Aaron Neville singing “I Shall Be Released” by Bob Dylan.